Freehand bows over Birthday Cake (Lush Lacquer). I layered Birthday Cake over Light As Air (China Glaze) because I wanted to save as much as I could. I also put a very thin layer of Marshmallow (Essie) over everything because I liked the glitter to appear less shiny, like it looks in the bottle. This is dedicated to Bree! I thought it appropriate to use Birthday Cake on her birthday! Happy birthday girl!!! I love this! It reminds me of confetti cake which is my favorite! 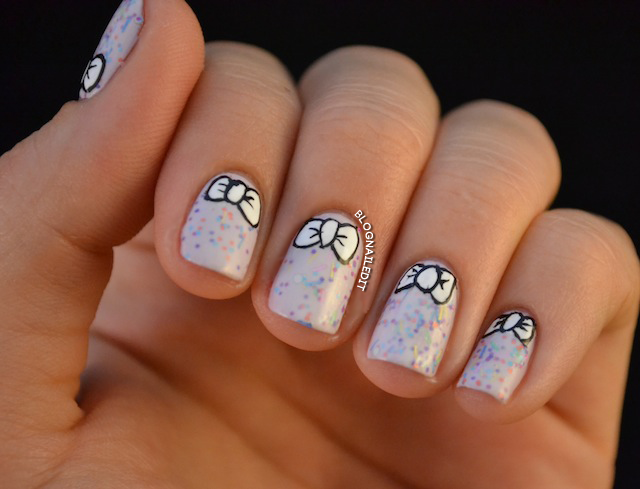 I love the bows, wish I could freehand like that!! I really like this mani! super cute plus i love the bows! This is super cute!! Your artwork is amazing!! Aw such a cute mani!